The 20-day period after herbicide application is critical in determining herbicide losses in runoff. Infiltrating rainfall (or irrigation) during this 20-day period will assist in reducing the amount of herbicides lost to runoff whereas significant rainfall leading to runoff will cause relatively high herbicide runoff. Farmers can reduce potential residual herbicide losses by using overhead irrigation after spraying (e.g. on bare soil - wait at least two days after herbicide application before watering and ensure no runoff occurs). Farmers should not apply herbicides to water logged soil or if runoff-causing rainfall is predicted within 48 hours of the planned application. This project demonstrates that targeting nutrient and herbicide application rates to suit crop and paddock requirements should improve water quality. Two monitoring sites have been established in the Sandy Creek catchment, south-west of Mackay. The treatments within each site employ different soil, nutrient and herbicide management practices. Rainfall, runoff, water quality and farm operations were closely monitored during the 2010-2011 wet season. This case study outlines herbicide results from one treatment at the Victoria Plains site (uniform clay soil). The selected treatment (1.5 metre row spacing) was harvested on 3 September 2010 and the cane trash remained on the soil surface. The herbicide Velpar K4 (diuron and hexazinone) was applied as a blanket application to the cane trash on 13 September 2010 at 3.8 kilograms/hectare. Samples of cane trash were collected up to 100 days after herbicide application and analysed for herbicide concentrations. Over 30 runoff events were monitored during the 2010-2011 wet season. Runoff from the treatment (runoff plot area approximately 1300 metres square) was measured through a flume with samples collected automatically and analysed for herbicide concentrations. A total of 3300 millimetres of rainfall was recorded between 1 September 2010 and 30 April 2011, well above the estimated long-term average of 1468 millimetres. This resulted in 1751 millimetres of runoff, with the first runoff event occurring seven days after herbicide application (there was no rainfall recorded prior to the event that caused runoff). 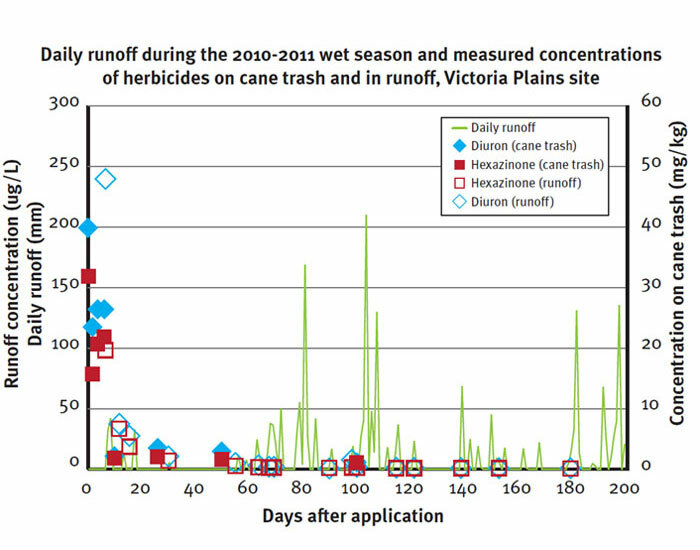 Peak concentrations of diuron and hexazinone were detected at the first cane trash sampling after application, and rapidly declined within 10 days of application. This decline would be due to both decay of the pesticides and rainfall (143 millimetres) washing the pesticides off the cane trash and into the surface soil (some would also be lost in runoff). The calculated field dissipation of diuron and hexazinone on the cane trash blanket was 11 and nine days, respectively. Diuron and hexazinone were detected in relatively high concentrations in the first runoff event, which was seven days after application. The maximum concentrations for Diuron and Hexazinone were up to 240 micrograms/litre and 100 micrograms/litre, respectively. Concentrations then rapidly declined at a rate similar to the dissipation on the cane trash blanket. 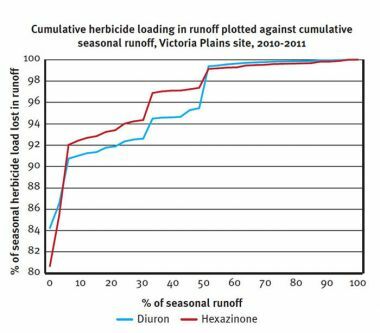 By mid-October (within one month of herbicide application), approximately 92 per cent of the total runoff loss of these herbicides had occurred for the wet season, although only six per cent of the season’s runoff had occurred. 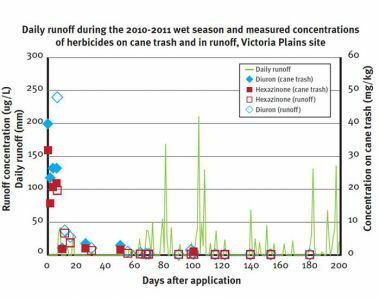 As the wet season progressed, more of the herbicide would have moved from the cane trash blanket into the surface soil, reducing the amount of herbicide potentially available for runoff loss. 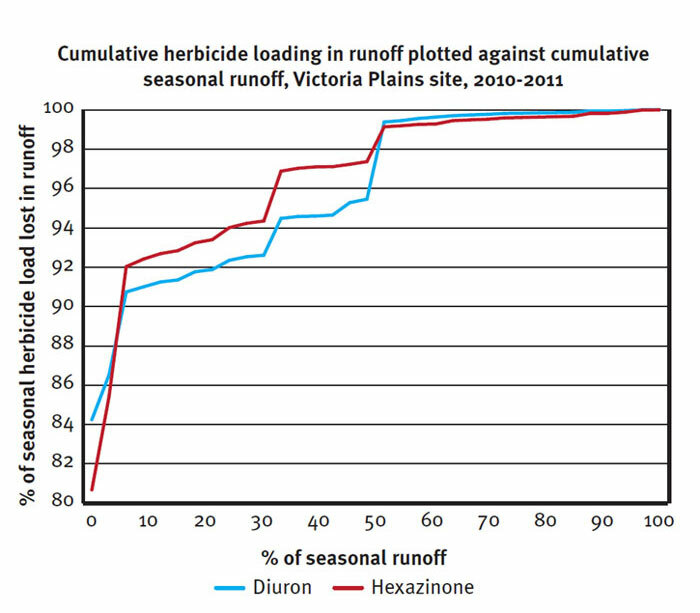 Infiltrating rainfall events prior to runoff help move the herbicide into the surface soil, as was experienced in the 2009-2010 wet season when runoff herbicide concentrations (maximum concentrations of 18 and 41 micrograms/litre for diuron and hexazinone, respectively) were much lower than in 2010-2011. Monitoring is continuing during the 2011-2012 wet season. Much lower herbicide concentrations are expected this season, as more than 100 days passed between application and the first runoff event. Ken Rohde and Kaela McDuffie (Queensland Government Department of Natural Resources and Mines); John Agnew (Mackay Area Productivity Services); Belinda Billing (Reef Catchments Mackay Whitsunday Isaac).